The Sharing feature enables you to create a secure URL that links to your portfolio. 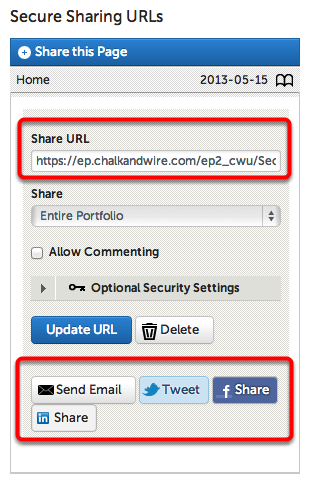 This is helpful if the person that you would like to share your portfolio with does not have a Chalk & Wire account. It is important to note that you should NOT copy the URL directly from your browser window to share your portfolio. This is an unsafe practice, as it will temporarily grant the URL recipient access to your account. 1. If you would like to share your entire portfolio, click on the Share this Page button. 2. The Share URL field will be filled with the secure, direct URL once you have generated the URL. 3. Select which sections of your portfolio you would like to share. 4. Select whether or not to Allow Commenting. 5. Optionally select Security Settings, such as a password required for viewing, and an expiration date for the URL. 6. 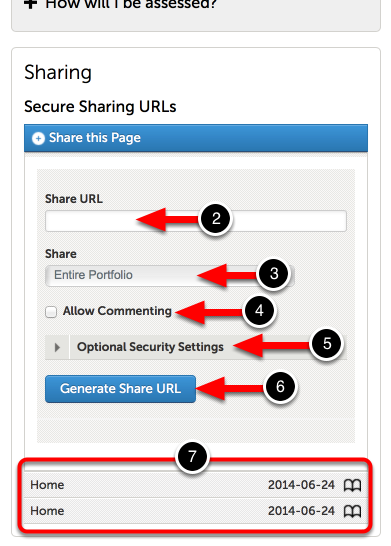 Click on the Generate Share URL button to create the secure Share URL with your selected settings. 7. View previous shares by clicking on them. After generating the URL, sharing options will appear at the bottom of the Sharing section. Use the options provided to share the URL via email, Twitter, Facebook, and/or LinkedIn. Alternatively, you can copy the URL, by highlighting it in the Share URL text box, and paste it in an email, on a webpage, etc.